Back in the earlier days of the blog, we made these delicious baked chicken flautas. They certainly were tasty. So much so that when my brother and sister invited us over for a Mexican fiesta, I wanted to remake them. It’s hard to believe, but this time around they were even better. We mixed the spinach with chicken, added a little more spice, and used flavored tortillas. No major changes, but the result was fantastic. These are definitely a go-to party appetizer. Unfortunately we ate them all before I could take a picture of the final product. Oops. Guess we need to make them again! Redone from the baked chicken flautas recipe. Yes, I have changed the name to taquitos because that’s what we kept calling them. They are the same thing as flautas as far as I am concerned. Note: The recipe below makes a TON. You can easily cut it in half and have plenty. 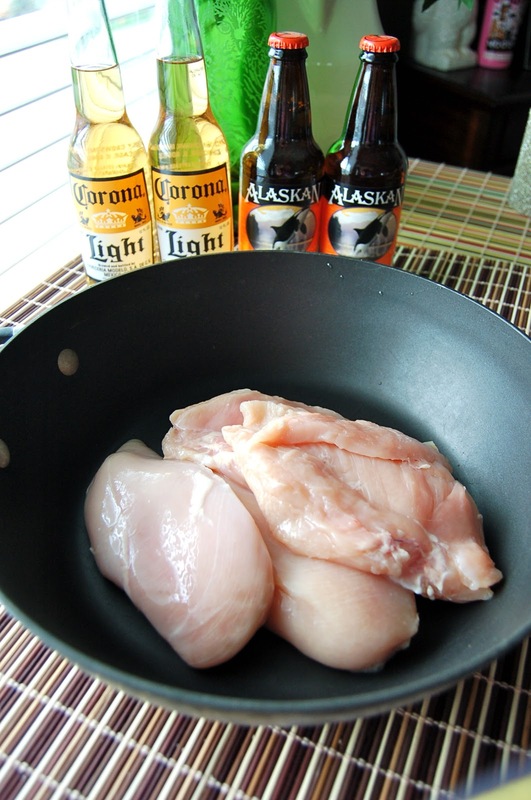 In a large saute pan, add the chicken and beer (and water if necessary). Bring to a boil, then reduce heat and simmer for 7-10 minutes until the chicken is cooked through. Be careful not to overcook otherwise your chicken will be dry. Remove the chicken from the liquid and shred it. Save about 1/4 to 1/3 cup of the liquid. To the mixing bowl, add the spinach, jalapenos, and all of the spices. Add some of the reserved liquid if needed to make sure the mixture is moist. Mix well and adjust spices for taste. Preheat your oven to 415 degrees. Cut the tortillas in half. Spoon a little bit of the chicken and spinach mix along the cut edge of a tortilla. Sprinkle with a little cheese. Roll the tortilla up, starting with the straight edge. Make sure it is rolled very tightly to prevent leakage or unraveling. Place seam-side down on an oiled baking sheet. When placing tortilla on baking sheet, leave a little space between them so that they are able to evenly crisp. Spray the tops and sides of the taquitos with Pam. Bake for 10 minutes or so until the tops begin to brown and crisp. Turn them over and bake for until for another 10 minutes (but probably less) until lightly browned and crispy.